So many ideas float through my mind when I look at minibooks from Minted. Check out the wonderful sample below and click for more information from Minted. I love being affiliated with them and may be compensated for helping you out with this great idea. Save the Date Minibooks are a great idea as there is so much information you can put in one. You can inform your guests with wedding details ahead of time to allow them time to plan accordingly before a formal invitation. This is going to be very important if your wedding is falling on a long weekend, a significant date for your family, or somewhere where the majority of your guests are going to need accommodations. You might think why would you do all this and then also do a formal invitation. Use your wonderful engagement photos and show them off with early information about the wedding. When it comes to sending a formal invitation, you can keep the formal one simple to save with cost. 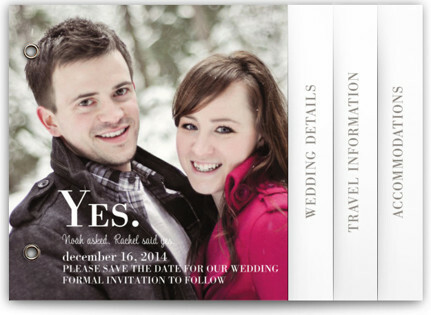 You will really just be reminding of the date and confirming time of your wedding on the invitation.